It has been a while since my last post and there are many reasons for that, but I won’t be getting into that as I have something far more important to share! 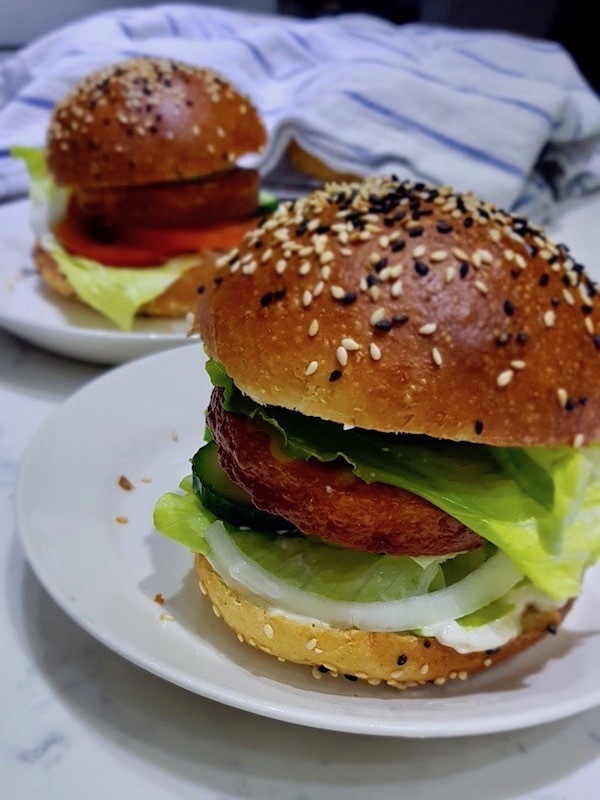 These wholesome oat and wheat burger buns with simple steps and some waiting time, might just be what you need to up your burger party! 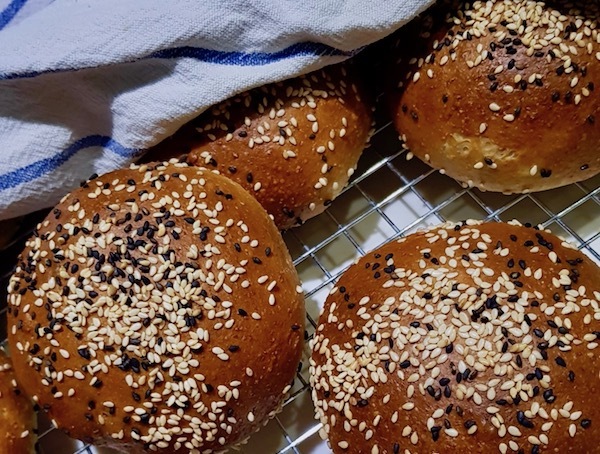 Golden brown exterior topped with sesame seeds (I used roasted white and black sesame, and plenty of both!) and an airy light fluffy texture inside. Totally worth the wait and you can prep them before and store in freezer to preserve the freshness. I am using ISTAD freezer bags and storing them in pairs with a plan to defrost and returning to oven just for a warm up for next round. What is your favourite burger patty and toppings? 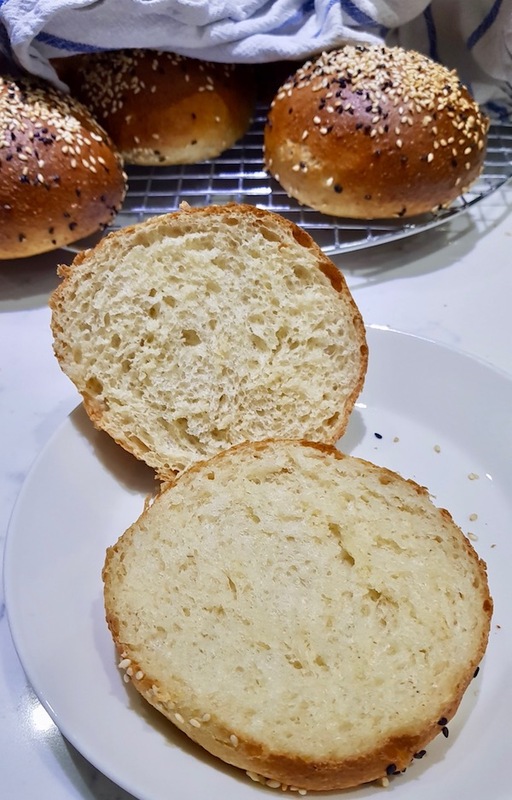 Hope you give these buns a try and let me know what you think. Like always addition to commenting here, you can contact me via email, Facebook or Instagram. In a small bowl mix dry yeast in water and set aside for 10 minutes. Meanwhile in a mixer bowl combine flours, milk, and sugar. Add the activated yeast in the mixing bowl and start mixing by hand using a wooden spoon or in mixer with dough hook attachment on low speed. Once starts to assemble a dough add egg, olive oil and salt and continue kneading for 15 minutes until all combined into a soft, lightly sticky dough. Place in a lightly oiled bowl and cover with plastic wrap. Allow to rise until almost doubled in size, approximately 1h. On a lightly floured surface divide the dough into 9 sections and shape each into a ball and place onto a parchment paper over a baking sheet. Lightly cover with plastic wrap and leave to rise for another 45-60 minutes. Preheat oven to 200ºC (395ºF) and make egg wash from a egg, tiny bit of water and pinch of salt. 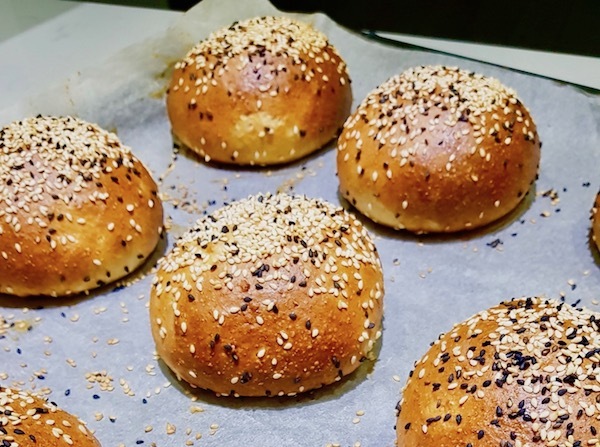 Uncover the buns and brush them with egg wash then sprinkle sesame seeds on top. Bake in preheated oven for 12-15 minutes until beautifully golden brown. 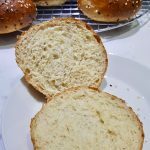 Allow to cool a bit over a wire wrack covered with a tea towel before cutting and filling your bun.